This city goes by many names: The City the Size of a Kingdom; The City of Trade; but mostly: Nuiwar. This city, in its grandeur, is poisoned by a group pulling the strings of the governing puppet, spreading influence through the country, and planning on using this trade hub as their greatest means to do so. However, a group led by one of this group's escaped prisoners is being built to fight it. Through the grapevine, you've heard rumors of a rebellion starting, and the people to join it gathering here, in an abandoned house on the edge of the city, right next to the wall. You've decided to join up, and in doing so, meet the rest of your soon to be comrades. This RP is based in a DnD-like world, so the races here are DnD races. On another note because I’ve been reading Overlord, how OP can one get? Hm... maybe I'll add my d&d character Palacus Brontavi later. Like a 6 minimum, 11-12 maximum. Can it be 13? At least then the Rogue class gets another upgrade/ability. )@##!##. At 13 I gain the ability to use any magic items, no matter the restrictions, so I could totally throw the BOSC into here as a joke. but wouldn’t there only be one of those in a world? ... Can he be an NPC? Or is this so long after that he’d be dead? If so, I have ideas. I guess I’d better sign up, huh? Weapons/Equipment: two chain weapons with blades at the ends, leather armor, a components pouch, a bowl, and a foot long stick. Personality: he’s a quiet person, yet he knows how to take charge when he needs. He likes to help others out whenever he can, sometimes throwing his own well-being to the wayside. Background/Bio: He was once imprisoned by the group now controlling the government for deciding to fight back against them, and he was going to be sold as a slave, if it hadn’t been for him and another escaping while in the city. There they encountered two other runaways*, who they helped to escape. While the first man he met had fled the city to go south, he stayed behind with the other two, determined to get people together to fight this force against them. *these two will get signups later. I’ll use a character idea I thought up a while back. 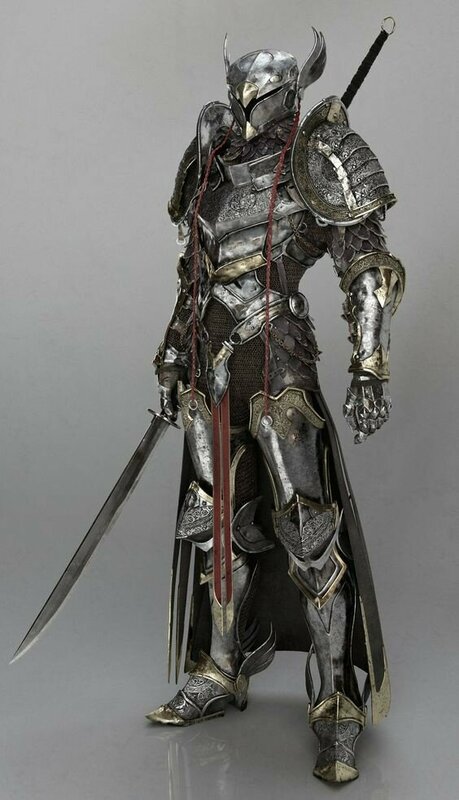 Weapons/Equipment: enchanted Full Plate Armor that full obscures his figure and contains his cursed magic. A extremely sharp shortsword and mace. Spells: Anything he touches directly (bar his magic armor and other magic items) will become extremely sharp everywhere, and turn itself into a blade or other sharp object. This effect is permanent unless undone with magic. This magic can’t be removed from his body, but can be temporarily stopped by an antimagic field. Personality: A dark and brooding personality, who considers it his one purpose in life to serve the one who saved him and gave him his ability. However he often aims with little purpose, for his master rarely contacts him. If he hears anyone speaking ill of his master or of the boons he recieved from his master he’s prone to lashing out. Background/Bio: Bradley showed promise as a young knight. He was gifted with a weapon, had a cool head, and had a solid body. He served in his (foreign) nation’s military for a while, and eventually got designated to lead a group of knights to deal with some monster that had popped up. However the creature was much more powerful than expected and after slaughtering the vanguard of the small group, the knights realized what they were up against and despaired. Bradley realized it was likely that here was where death would meet him, and decided to do his best to provide a chance for his team to escape. He engaged the massive monster only to be quite literally kicked out of the way as the creature pursued the fleeing knights. In a cruel twist of fate the knights he had attempted to save unintentionally gave their life to save his. Although he wouldn’t have lived much longer if a wandering being hadn’t passed by. The being took pity on the knight, and offered to save his life and to kill the monster in exchange for Bradley’s loyalty and a portion of his humanity. The grief stricken knight agreed and was given his magical ability as well as his magic armor, but in exchange was horribly disfigured, parts of him growing blades and strange objects at random. The being gave his name, claiming to be his new master and Bradley his weapon to be used whenever he wished. He then sent Bradley off, promising to contact him whenever needed. Bradley then spent the rest of his time travelling and honing his skills, completing small tasks as his master demanded. Eventually he found himself in this new land, with a new goal. Anything he touches directly (bar his magic armor and other magic items) will become extremely sharp everywhere, and turn itself into a blade or other sharp object. This effect is permanent unless undone with magic. Does this have any drawbacks, such as exhausting him at all? No not really, but it shouldn’t come into play unless his armor is taken away. Alright then, accepted, assuming it is used infrequently. Also, Fobend now has a picture up. Background/Bio: Masdor came to Nuiwar in search of work, but soon found out about the corrupt government. Appearance: Brown armour with dark green highlights, dark green face mask, sheath on back. 5' 11", slim, dirty blonde hair, blue eyes.